Tyrol, Austria, or southern Germany, ca. 1500. 17th-century brown morocco over 15th-century boards, 4 holes in corners and one at center on upper and lower covers for bosses, now lost; originally with two spaced clasps, now with one leather clasp with brass fitting at center, very badly attached; three sewing bands on spine. On fol. 1r, the date Anno 1620 3 Apprill...; on fols. 1v-2r, the date: Anno 1635; on fol. 2v, the dates 3 Juni Anno D. 1579 and 1640 (or 1648); on fol. 3r, the dates 1517 and (in a different hand) 1518; owned in the 17th-century by the Frölich family of Innsbruck (inscriptions on front pastedown include: Johan Baptista Alegro, Madelena Frolich, Johan Battista Frellich; Alegro, Frolich, Frellich and Frellichin are variants on the same family name; these inscriptions were probably added when manuscript was cut down and re-bound in the 17th century); under coat the of arms on fol. 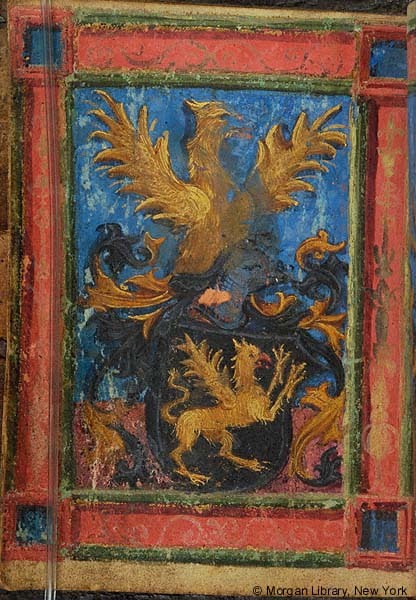 5v the name Johannes Bap.... Voeths...; under the coat of arms on fol. 6r the name Magdalena Frellichin; E. Clark Stillman Collection. Ms. book of hours, written and illuminated in the Tyrol, Austria, or in southern Bavaria, ca. 1500. Decoration: 4 full-page heraldic compositions; 20 full-page miniatures; 7 smaller miniatures, 1 very wide full illuminated border; rubrics in red; capital letters stroked in red; nomina sacra underlined in red; several 4-, 5-, and 7-line purple, blue or pink initials with white highlights against burnished gold grounds in red and green particolored frames ("Augsburg" type) highlighted with yellow, a few with truncated vine borders and gold dots; several 2- and 3-line initials in two-toned burnished gold, outlined in black, with green or red fleuronnée decoration in margin hugging text block; Gothic style. The illumination of S.14 is unfinished. The miniature of St. Catherine (fol. 244r) was not completed. The subjects of the miniatures are as follows: 1. fol. 6v: Annunciation -- 2. fol. 33v: Christ of Sorrows -- 3. fol. 36v: Arrest -- 4. fol. 43v: Christ bearing Cross -- 5. fol. 47v: Crucifixion -- 6. fol. 51v: Crucifixion with kneeling male donor -- 7. fol. 55v: Entombment -- 8. fol. 59v: Pietà -- 9. fol. 62v: Entombment -- 10. fol. 68v: Dove of Holy Spirit -- 11. fol. 82v: Christ of Sorrows -- 12. fol. 113v: God the Father or Christ instructing kneeling man -- 13. fol. 118v: Virgin Mary and Christ Child -- 14. fol. 132v: Gnadenstuhl (Mercy Seat) -- 15. fol. 139v: Veronica holding veil with Holy Face -- 16. fol. 142v: Priest saying Mass at altar -- 17. fol. 164v: Nativity -- 18. fol. 171v: Resurrection -- 19. fol. 178v: Ascension -- 20. fol. 180v: Pentecost -- 21. fol. 183v: Last Judgment -- 22. fol. 193v: Sebastian of Rome -- 23. fol. 196r: Two souls lifted out of flames of Purgatory by angels -- 24. fol. 205r: Martyrdom of Sebastian of Rome -- 25. fol. 213v: Evangelist John -- 26. fol. 242r: Barbara of Nicomedia -- 27. fol. 244r: Catherine of Alexandria (unfinished: ground only). Collation: I4+1 (fols. 1-5; stub of fol. 5 between fols. 16-17); II12 (fols. 6-17); III12 (fols. 18-29); IV12 (fols. 30-41); V10 (fols. 42-51); VI10 (fols. 52-61); VII12 (fols. 62-73); VIII12 (fols. 74-85); IX12 (fols. 86-97); X12 (fols. 98-109); XI10 (fols. 110-119); XII12 (fols. 120-131); XIII12 (fols. 132-143); XIV12 (fols. 144-155); XV12 (fols. 156-167); XVI10 (fols. 168-178); XVII12 (fols. 179-190); XVIII12 (fols. 191-202); XIX10 (fols. 203-212); XX12 (fols. 213-224); XXI12 (fols. 225-236); XXII12 (fols. 237-248); XXIII8+1 (fols. 249-257: newer vellum, clean, unruled, blank, structure of gathering unclear); XXIV2 (fol. 258, conjoint with back pastedown); no catchphrases or signatures except fol. 42r: lower right corner, truncated o (?) in red; 73v: trace in black; 132r: lower right, cursive letter I in light brown; additional illegible, trimmed traces, also in brown ink, on fols. 144r, 156r, 179r, 203r, 212r, 237r.